View of Görlitz from the bridge linking it with Poland. Görlitz  is Germany's easternmost town, situated across the Neisse River from its Polish sister city of Zgorzelec. It is very well preserved and survived the Second World War more or less intact. A lot of money was invested in the 1990s to restore the city's old town. It is located on the rail and autobahn routes from Dresden to Wroclaw, Poland. The closest airport is in Dresden; however, the connections are limited. Other international airports are in Leipzig, Berlin and Wroclaw (Poland). From these cities you have to calculate around three to four hours on a train. The city of Dresden is a hub in train transport in eastern Saxony. Regional trains run frequently and take around one hour. Görlitz can be accessed by regional train from Cottbus, which has a connection to Berlin. There are several connections daily from Görlitz and more frequent connections from the Polish twin city Zgorzelec to Wroclaw. As of September 2015, there doesn't seem to be any train connection over the border at Görlitz; there is however a bus (line P) which connects the stations of Görlitz and Zgorzelec. There is a regional line connecting Görlitz and Zittau at the Czech/Polish/German border, sometimes this train also connects to Liberec in the Czech Republic. Görlitz is situated on the European Route E40, which in Germany is called motorway A4, coming from Cologne via Chemnitz and Dresden. This motorway connects to Wroclaw and Katowice on the Polish side of the border. Görlitz can be accessed via federal highway (Bundesstrasse) B115 from Cottbus, which connects to Berlin. However, passing through many small villages you have to factor in a substantial amount of time. You are most likely to stay in the old town and city centre for most of your stay. These areas are sufficiently confined and you should be fine walking. Currently there are two tram-lines in operation which connect the suburbs with the city centre. The outer regions of the suburbs are about 5..6km from the city centre. A tram ride there takes about 15min. Single fare for adults is 1.40 EUR, a day ticket is 3 EUR (as per 2014). Remember to validate your ticket as soon as you board the tram. Görlitz is part of the regional transport council ZVON. All ZVON tickets from other cities and regional trains, which cover the fare zone of Görlitz are valid there too as well as the Saxony-ticket. Suburbs that are not covered by trams can be reached on local busses. The tickets you buy for trams are equally valid on busses. Remember to validate your ticket as soon as you board the bus. Görlitz, being the largest city in Germany without any WWII- damages, shows a unique ensemble of a medieval, baroque and renaissance old town, surrounded by by a c19-belt of tenements, villas and industry areas, which stretches across the Neisse to the former East Görlitz, now Zgorzelec. Only the far outskirts are new buildings. After german unification most of the buildings were renovated. 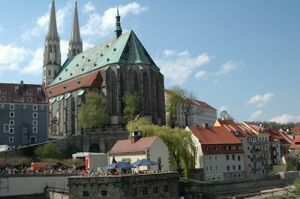 This makes Görlitz a unique heritage city with several thousands of listed buildings. Simply stroll around the town and enjoy the atmosphere. Visit the Silesia Museum - a museum dedicated to the history of Silesia. Walk along the Neisse River bank and enjoy the view of the older buildings and the abundant nature. Tour the cathedral and the main street in the Old Town. Take a stroll across the Neisse River into Poland using the new pedestrian footbridge and get a different perspective of the old town from a distance. Walk up the Landeskrone Mountain. Landeskrone is roughly 200m above city level, and the walk up is about one hour from the tram station in Biesnitz (tram-line #2 from city centre). Nice weather provided it makes for a good afternoon stroll. visit the new lake on the southern limits of town. This lake has been made in the recent years to rehabilitate an open-pit coal mine, that has been closed in the early 1990s. souvenirs from various Silesian themed souvenir shops in the old town. You will frequently find porcelain with a distinctive pattern. This porcelain is known as 'Bunzlauer Keramik', named after the German name of Boleslawice in Poland. There is a number of book antiquaries in the old town which always have nice bargains. The number of foreign-language books is limited, though. bring a bottle of the local beer. It is called Landskron, after the mountain close by. Germany is best known for its amazing beer heritage and the area of Görlitz and eastern Saxony is no exception. There is a local brewery in Görlitz, called the Landskron Brauerei, and in about 20km distance is another local brewery, called Eibau. The main product of the Landskron Brewery is a Pilsner type beer. Pilsner type beers can be compared to what is known as Lager outside of Germany, however, this type is stronger and has a more distinctive taste of hops. The brewery also produces seasonal beers, for example "Maibock", a beer that is only sold in Spring and stronger than normal Pilsner type beers. Other Pilsner type beers well known in the area are Radeberger beer or Freiberger beer, which are from breweries close to Dresden. The Eibau brewery some 20km from Görlitz is best known for its dark beer. Dark beers are different from the Pilsner type beers, because the brewery uses roasted malt which gives the beer a deeply dark colour and a distinctive taste. An other dark beer well known in the area is from a brewery called Köstritzer brewery, which is located in Thuringia, some 400km west of Görlitz. The city is home to a nice historic youth hostel. This page was last edited on 21 June 2017, at 00:02.